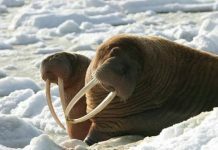 The walrus (Odobenus rosmarus) is one of the largest marine mammals in the Arctic with adults weighing up to 4,400 pounds. Walruses have only a few natural predators in the wild for they are probably too big to get caught even by the largest of the predators. Still many people wonder what eats walruses in the wild. Let’s see what are walrus predators. 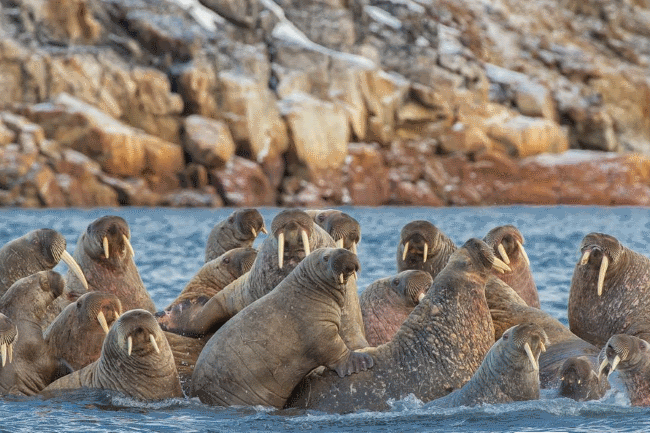 Killer whales and possibly polar bears are thought to be the potential predators of walrus. Young polar bears rarely go after the walrus. Adult bears mostly hunt walruses but even adults would prefer to feed on young walruses. The adult walruses can potentially cause serious injuries to the polar bears if the latter get caught within the group of a walrus. Nevertheless, walruses do not make up the top menu item of either orcas or polar bears. Polar bears only hunt walruses when they do not find seals which are ultimately their primary diet. In other words, walruses would be the last foods polar bears would to like to eat. Similarly, killer whales go after the walrus’ calves for they are less likely to look at adult walruses as a potential food source. Walruses often breed in large groups consisting of thousands of individuals. When a polar bear rushes at them, the entire group sprints to the beach and in the process they kill many walrus’ calves. The bear drags the calf to eat later. Scientists however do not know why walruses behave the way they do about certain things. Even if an adult walrus gets injured it is least likely to be vulnerable to the polar bears. Bears never go after the adult walrus from the front. Even the injured walrus can successfully defend against polar bears. Orcas, on the other hand, must coordinate in groups to kill adult walrus. Unlike polar bears, orcas get little injuries whilst attacking walruses. Ovsyanikov, N. (1992). “Ursus ubiquitous”. BBC Wildlife. 10 (12): 18–26. Jefferson, Thomas A.; Stacey, PAM J.; Baird, Robin W. (1991). “A review of Killer Whale interactions with other marine mammals: Predation to co-existence” (PDF). Mammal Review. 21 (4): 151. doi:10.1111/j.1365-2907.1991.tb00291.x. Calvert, Wendy & Stirling, Ian (1990). “Interactions between Polar Bears and Overwintering Walruses in the Central Canadian High Arctic”. Bears: Their Biology and Management. 8: 351–356. doi:10.2307/3872939. JSTOR 3872939. 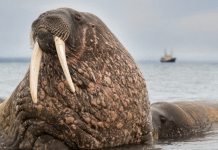 Do Female Walruses have Tusks?